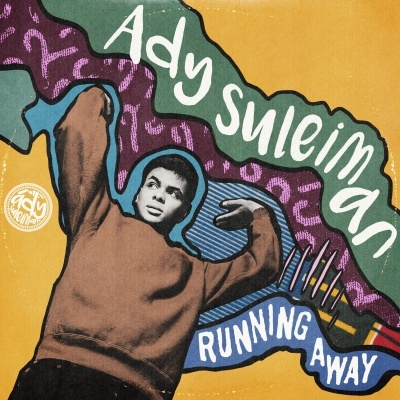 Not long after completing his second UK headline tour and supporting Leon Bridges in Europe, Ady Suleiman is set to release his debut single, ‘Running Away’. Written by Suleiman, ‘Running Away’ is produced by Jonny Coffer (Jess Glynn, Beyonce, Naughty Boy) and follows Ady’s past two EP releases, ‘This is my EP’ and ‘What’s The Score’ (featuring Joey Bada$$) which drew plaudits from the likes of Fader, Beat, Line of Best Fit, Clash, SBTV and BBC Introducing to name but a few. The Winta James remix of ‘Running Away’ is already on heavy rotation in the clubs and on pirate radio stations, and added to Radio 1 Xtra’s playlist, where it was premiered by MistaJam. The video for ‘Running Away’ was shot in Langa, Cape Town and was directed by Calmatic and Director X (Zayn, Rihanna, Kendrick Lamar, Drake). With early co-signs from Chance The Rapper and Joey Bada$$ (who featured on Ady’s ‘What’s The Score’ EP last year), 23 year old Ady Suleiman is set to emerge as one of the most unique artists in the UK. A deft songwriter and a singer with soulful brilliance and a rich era-spanning appreciation of music, Ady has developed a timelessly classic yet fresh sound which has been described as a “holy trifecta of R&B, hip-hop, and reggae” (The Fader) and garnered him influential fans from both sides of the Atlantic, including Frank Ocean, Little Simz and Labrinth. After being discovered by BBC Introducing’s Dean Jackson (who also discovered Jake Bugg among others) and subsequently becoming the first (and last artist) to have a track go straight into the top 20 on Shazam off the back of one radio play, Ady supported Laura Mvula, Michael Kiwanuka, Professor Green and Lianne Le Havas on tour and won ‘Breakthrough Act of the Year’ award at Gilles Peterson’s Worldwide Awards before signing to Sony, via his own imprint Pemba Records. In addition to releasing his debut single ‘Running Away’ on June 10th, this summer will see Ady perform at a number of festivals over the summer including Glastonbury and V ahead of releasing his forthcoming debut album.